Grease traps have been used since the Victorian times. They are used to reduce the amount of fats, oils and greases (FOG’s) that enter the main sewers. Effectively they are boxes within the drain run that are located between the sinks in a kitchen and the sewer system. They only have waste water flowing through them and are not served by any other drainage system such as toilets. They can be made from a number of different materials; e.g. Stainless Steel such as the Maxi-Trap design, Mild Steel, Plastics, Concrete, Cast Iron and can hold anywhere between 40 liters to 45000 liters and above. They can be located above ground, below ground, inside the kitchen or outside the building. Airload Environmental will thoroughly remove all of the accumulation from the top to the bottom of your grease trap interceptor. 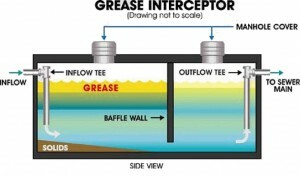 Our Grease Trap Interceptor cleaning and pumping service will thoroughly remove, clean, and dispose grease, water waste and solid accumulation from the Grease Trap Interceptor system. Our highly skilled technicians will meticulously scuff away grease deposits and make certain that all waste is pumped out completely. Servicing the FOGS (Grease Trap Interceptor) device regularly can prevent solids, grease, fats, oils from contaminating your outbound lines, unpleasant smell, and old grease build up that causes costly problems. Never the less Airload Environmental will fully remove and haul away all the content of the Grease Trap6 Interceptor device; will do it right the first time and make sure that our clients receive the top quality that they deserve.